The cutthroat board game Monopoly might have divided more families than have brought together, and in The Kings of Summer, it is a catalyst that drives men mad. This 2013 comedy is an endearing ode to attain freedom during one’s adolescence. Filled with both promising newcomers and cult comedy stars, The Kings of Summer is never forceful in its humor. It depicts the freedom of nature as a beauty to behold and manhood as an earned attribute. Joe Toy (Nick Robinson) has just completed his freshman year in high school, and his relationship with his widower father (Nick Offerman) has become turbulent. Joe’s best friend Patrick (Gabriel Basso) is also annoyed with his own square, mindless parents. After an outdoor kegger goes awry, Joe escapes to the woods where he discovers a clearing that speaks to him. When a family Monopoly game becomes heated, Joe convinces Patrick and the idiot savant Biaggio (Moisés Arias) to run away from their safe, suburban homes and build their own cottage in the forest. The film begins with the young men creating a percussive rhythm with sticks against a large, rusty pipe that cuts through the forest, while Biaggio dances on it with serioso. It is a slice of a life the three have created for themselves and one of the most profound images of the freedom and fun they experience. 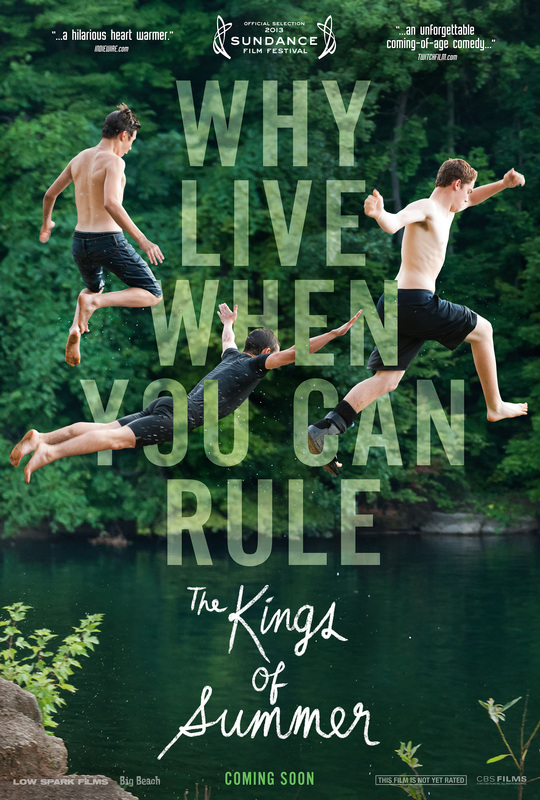 The most pleasant aspect of The Kings of Summer is how well it bucks the formulaic while maintaining its own rhythmic pacing. The house they build is made out of scraps of wood, metal, and anything discarded by others, but nowhere near what they envision on their hand-drawn blueprint, which included a kitchen and master bedroom. What is erected in the middle of the forest is the bare necessities for three fervent, soon-to-be high school sophomores, a roof over their heads, and the possibilities that surround them. After the house is built, Joe confides in Patrick that they seemingly have it all: beer, food, safety, and foremost, freedom. The only thing missing: a woman’s touch. They soon invite some friends to the house in secrecy, particularly Joe’s romantic interest Kelly (Erin Moriaty) who brings news that the boys’ disappearance from their homes have troubled the neighborhood and their families greatly. Henry David Thoreau wanted to experiment with the romantic ideal of self-reliance and gain a sense of awareness that self-exile to the woods forces upon oneself. While Joe does purchase a few books to become more familiar with living in the woods, his attempt to read them amounts to little more than shuffling through the pages. But the three teenagers in the film simply want to do what every teenager wants to do: escape their parents. Joe and Patrick’s families are not even all that terrible; it is simply the fact that they are becoming their own people separate from their parents. It is a butting of heads that every family faces. The film is never overt, not in its humor or in its themes; it builds itself carefully over the course of the film. Furthermore, the film’s comedic relief comes at unexpected times, often at the height of incredible suspense and disillusion. The film captures the effervescence of the woods through slow motion and light diffraction, while contrasting it with the clumsy disposition of three teenage males struggling with puberty and attempting to enjoy the freedom in nature. While Robinson and Basso are the central characters, their third counterpart, Biaggio, offers a majority of the film’s comedy. His nonsensical phrases as well as a few contributions such as a machete and his concept of finer things in life such as dancing add that well needed idiosyncrasy to the film. Offerman, Alison Brie, and Megan Mullally offer additional comedy relief as they experience family perspective of the boys’ disappearance. There is a definitive scene where the boys play Monopoly with their guests in their makeshift home. The contrasting nature of a board game about acquiring all the money and real estate, under the roof of an improvised home to escape the comforts of suburbia, is the summation of the natural binary oppositions in life: living or making a living. 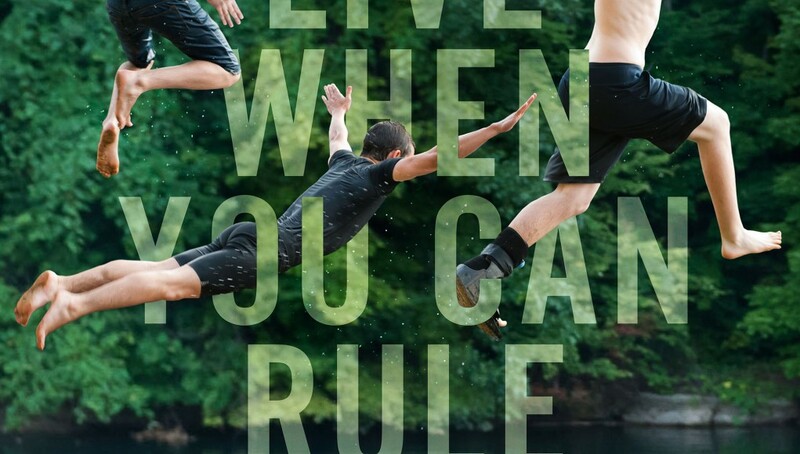 For The Kings of Summer, we witness three young men learning that comfort and freedom are not inclusive, but traits earned after a hard day’s work and tolerating the hell of the presence and desires of other people.